Any good blow, from a 15 mph gust to a day or two of stronger breezes, can produce great shells in the gentler days that follow. The rule of thumb is that the more vigorous a fall storm or wind, the better the finds afterwards. With the regular fall gusts that kiteboarders and windsurfers love, come massive piles of shells that accumulate on the beach. 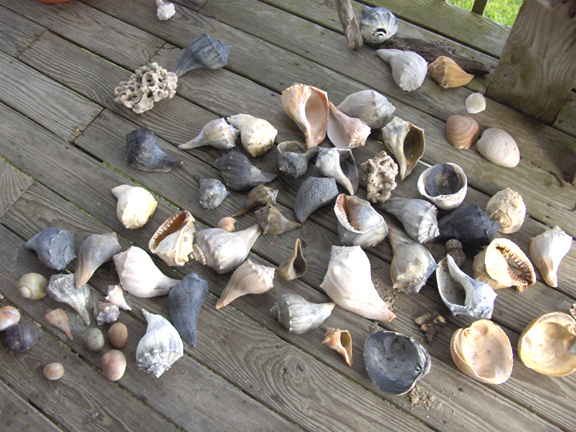 Take time to root through these piles, as often the best finds are the small augers, margarine shells, periwinkles, sundials, and tiny whelks that are hidden and protected among smaller shell pieces. Perhaps best of all, it’s not unusual to have a good shelling beach all to yourself. Try exploring early, as the old cliché that the early bird gets the worm applies to shells too, or take a late evening stroll after a high or low tide to up your chances of being the only shell hunter on the beach. Most important, don’t be afraid to explore more than one area – shells are notorious for being abundant in one area on any given day, and then completely disappearing the next. Covering more beach increases your chances of finding more shells. Can’t make it down right away? Not a problem. Once the cooler shell season arrives, the shelling stays good throughout the winter holidays and well into the spring, and there are always summer opportunities to find the delicate shells that prefer calmer waters, like a good intact whelk, sand dollar, or scotch bonnet. 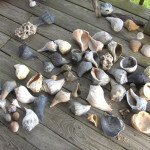 Basically, if you’re a beachcomber, any season can be a great shelling season.